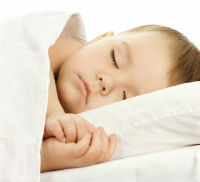 Is Your Child Having Night Terrors? It’s the middle of the night and you are awakened by your child screaming from his bedroom. You rush in to see what’s wrong and you find him sitting up in bed with a blank stare but very agitated. You try to wake him, asking him what is wrong but he doesn’t respond, he just keeps screaming. You are scared and don’t know what to do. After a few minutes, your child goes back to sleep and in the morning he doesn’t remember the episode. Your child just experienced a night terror. Although these are alarming, night terrors are harmless to your child. Although night terrors are harmless, you can still help to calm your child and keep him safe. Do not try to awaken your child. Turn on the lights so that your child won’t be confused by shadows. Remain calm, talk in a soothing tone, “You are okay, you are at home, you are in your own bed, you can go back to sleep.” Again, speak calmly, and keep repeating these soothing comments. You can try holding his hand or snuggling him, but if he pulls away don’t persist. Don’t try to wake him with shaking or shouting, this will only agitate him more and prolong the attack. Keep your child away from stairs, windows or sharp objects. Try to gently direct him back to bed. Be sure to warn babysitters, family members or others who might be caring for him at night. Explain to them what to do in case of an attack so that they don’t overreact.